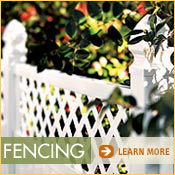 We are the best place to go when building your outdoor retreat. 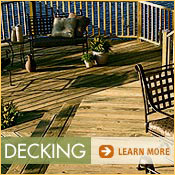 We have a variety of decking materials to choose from including the latest low-maintenance alternatives. We also have the know-how to help make your project a resounding success. In some ways deck building is a rather complex do-it-yourself project, but, since decks do not have to be leak proof or perfectly built, it is well within the scope of most novice builders. This website will provide you with the information you will need to do the work efficiently. Deck building can be a demanding job both physically and mentally. It is, however, very rewarding. It moves quickly and will give you a pleasing living area for a small price. Be sure you understand what you are doing before you proceed. 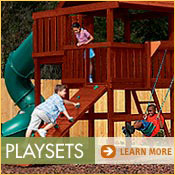 The key things to remember in deck building are to be sure you have used all the proper materials and construction techniques, to fend off the decaying properties of water, and to be sure everything is level, plumb, and properly built. Always use the appropriate tool for the job. Keep blades and bits sharp. A dull tool requires excessive force and can slip. Safety goggles and glasses should be worn when using power tools, especially if you wear contacts. Always unplug your power tools when making adjustments or changing attachments. Be sure your tools are properly grounded. Watch power cord placement so it does not interfere with the operation of the tool. Wear ear protection when operating power tools, because some operate at a high noise level which can damage hearing. Be careful that loose hair and clothing do not get caught in power tools. Be careful when carrying long boards at the site. Be careful to avoid back strain when lifting or digging. Wear heavy-soled, sturdy work boots. Bend from the knees when lifting large and heavy objects.